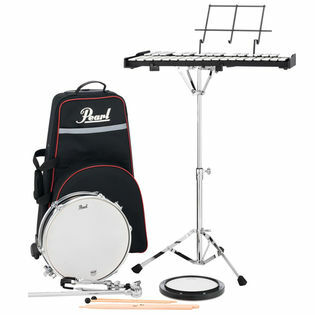 Why rent when you can own this Pearl combination Bell and Snare Drum kit for less money? This package is the best of both worlds for any beginning drummer. The Pearl Percussion Learning Center is the perfect combination percussive instruments that will allow any student to learn both rhythm and melody. Great ordering experience. I had to find a student percussion kit on quick delivery for my daughter who was beginning percussion at school and I did not wish to rent through the school. Several companies were out of this kit (which was the recommended set by music teacher). Fortunately, Steve Weiss Music had it in stock and were able to ship very quickly. Wonderful customer service!! Excellent service and quick delivery. My daughter loves the set! It has a great case that will roll to store it in. 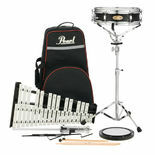 This is a great percussion set for students. Quality is good and the xylophone is very easy to assemble. The stand is not that strong to hold the Percussion Essential Elements book very stable, so sometimes we just use a regular stand in addition. Awesome product for the price!